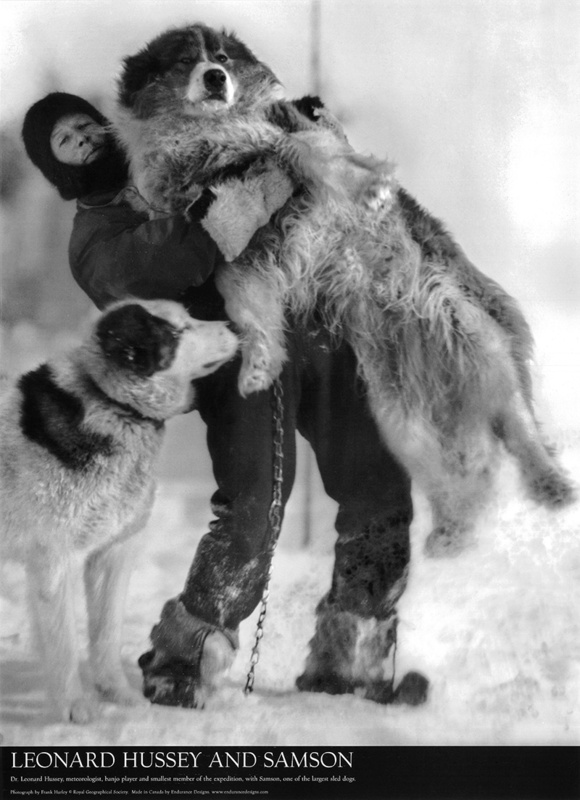 In this image, Londoner Leonard Hussey, at twenty-three years old the expedition's meteorologist and smallest man, is hoisting Samson, the largest sled dog. The full-grown pup to the left is Nell, one of Crean's pups born aboard the Endurance. Hussey's banjo playing was a life saving mental tonic for many of the crew members, especially as the going got tougher and tougher. The banjo was the only large personal item Shackleton allowed to be taken with the men when they were forced to abandon ship. Orde-Lees wrote of Hussey in his Diary, "He is a lean joist of unusual merit and it is very pleasant to have music of any kind down here; his banjo repertoire is sufficient to prevent his tunes becoming too monotonous...Hussey is one of our smallest members but he makes up in energy what he lacks in stature." Please do not copy or redistribute photos from this website without permission, thank you.